When I last posted anything about TwitRSS.me, I was complaining that I was getting a million requests a month. I am now getting over 2 million requests a day. A lot of the traffic on TwitRSS.me comes from Yahoo pipes — I am currently 404ing them because I don’t have the capacity to serve that much traffic yet. People have been generously donating, but I have yet to make enough to beef up the server. The code is all GPL and can be grabbed from the TwitRSS github if you want to play. I would anticipate adding the ability to pull in other pages like searches "at some point" but this is very much a side project, so don’t expect it to happen soon. And here is how that bit looks. This was all very cool. But I have been struggling to have the script direct the browser to an actual RSS feed. The technique that I have found works in most browsers except IE. I just use a Data URI. The code fetches JSON from YQL, pushes it into the specified jQuery element, then pulls it out again, constructs a data uri and directs the browser there. So that is the preview, let me know what you think in the comments. I should stress that this is very much alpha and very much a side project of a side project. 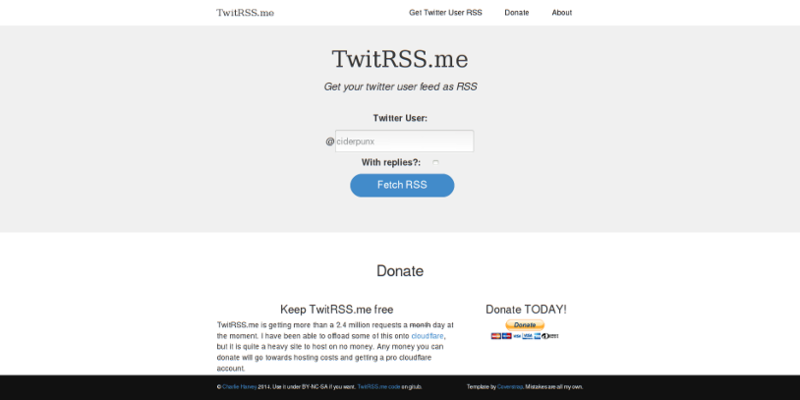 The requested URL /twitter_user_to_rss/ was not found on this server. am getting the above error after i host the script on my host.